The Code of Hammurabi was a code of Babylonian law, written about 1700 BC. The code of Hammurabi had 282 laws, written by scribes on 12 tablets. Unlike earlier laws, it was written in Akkadian, the daily language of Babylonia. 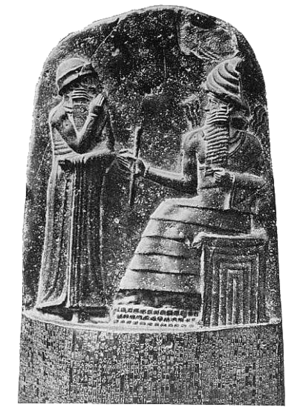 The Code of Hammurabi was one of several sets of laws in the ancient Near East. The code of laws was arranged in groups, so that everyone who read the laws would know what was required of them. There were earlier laws, and later laws such as the Law of Moses in the Hebrew Bible. These codes come from similar cultures in a relatively small geographical area, and they have passages which resemble each other. ↑ The Code of Hammurabi. , The History Guide, 3 August 2009, Retrieved on 2 November 2011. ↑ Flach, Jacques. 1907. Le Code de Hammourabi et la constitution originaire de la propriete dans l'ancienne Chaldee. Revue historique. Paris, 8. v. 94, p. 272-289. ↑ Burgess A.W. et al 2009. Victimology: theories and applications. Jones & Bartlett Learning, p.103. ↑ "The Code of Hammurabi: translated by L. W. King". Yale University. 2005. http://www.yale.edu/lawweb/avalon/medieval/hamframe.htm. Retrieved 14 September 2007. ↑ The Code of Hammurabi: Introduction. , Ancient History Sourcebook, March 1998, retrieved on 2 November 2011. ↑ 8.0 8.1 Barton G.A  2009. Archaeology and the Bible. University of Michigan Library, p406. This page was last changed on 16 November 2014, at 18:00.